↑ "glossary". Earth Observatory. NASA. http://eobglossary.gsfc.nasa.gov/Library/glossary.php3?mode=alpha&seg=f&segend=h। আহৰণ কৰা হৈছে: 2008-04-09. "Force: Any external agent that causes a change in the motion of a free body, or that causes stress in a fixed body." ↑ e.g. Feynman, R. P., Leighton, R. B., Sands, M. (1963). Lectures on Physics, Vol 1. Addison-Wesley. ; Kleppner, Daniel; Robert Kolenkow (1973). 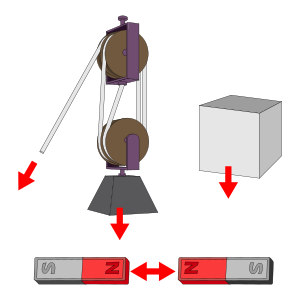 An Introduction to Mechanics. McGraw-Hill. পৃষ্ঠা. 133–134. ISBN 0-07-035048-5. .
↑ Heath, T.L.. "The Works of Archimedes (1897). The unabridged work in PDF form (19 MB)". Archive.org. http://www.archive.org/details/worksofarchimede029517mbp। আহৰণ কৰা হৈছে: 2007-10-14.